We had another mating flight today! Two new queens mean we don't have to buy queens. This is a good thing, I think. The bee's were bearding on an old waterer (we now water with chicken waterers), so we thought it might be time to add another super. All clamoring to see the "girls". Maid Elizabeth, Miss Calamity, Patrice and I. Oh, and Sir Knight's arm! Maid Elizabeth pulling a frame from the hive. 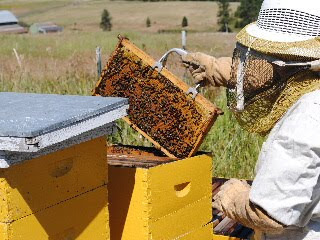 After inspecting the hives, Maid Elizabeth determined that we don't need to add a super quite yet. Just look at that beautiful comb! Notice the empty (white) spot in the upper right hand corner. 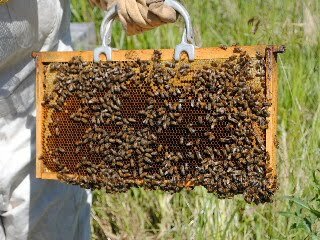 The bees leave a whole in their comb so that they can get to the other side without going over the frame! Brilliant! 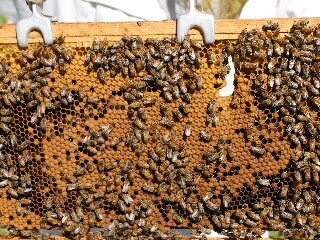 The bees have drawn all of this comb in the last two weeks. We started out with empty frames. Maid Elizabeth is getting everything put back together. Nothing more to do today. 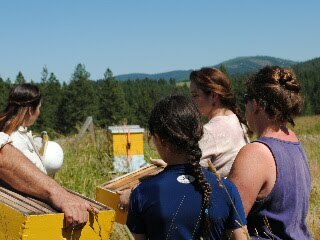 When the girls have filled the top supers with honey, we will add more so they can fill those too. The bee's motto seems to be "must fill empty space". Hey, I think that's my motto too! Love the bee stories and the photos. Is the bee population generally healthy in your region? 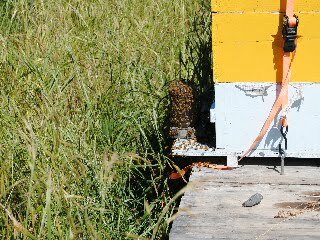 My mom's two hives were lost when she still lived in the central coast region of California a few years ago. It was so sad. One day they were fine, the next day they were dead. It's a heavily farmed area with lots of big commercial operations. Lots of bad chemicals. Yuck. We're so grateful to be outa there. 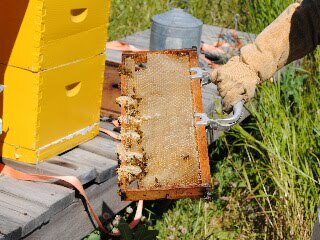 Our wild bees are pretty healthy, although we have been affected by the abandoned hive syndrome. I do think the chemicals are terrible for the bees. Thankfully all of our neighbors love our bees and are very careful with what they put on their fields.